When we moved here, the woods made room for us. So now, I love making room for the woods. Using rocks as the borders, each flower bed has both perennials and wildflowers. They have learned to meld and co-exist. I encourage it. As you can see, the nearly spent Daffs make room for Jack-in-the Pulpit, which I love! Persicaria (Painter's Palette), several varieties of Hosta and Ajuga work well with the Ostrich Ferns, Adder's Tongue and dainty Bluets. Can you tell I love the woods? I think you coexist very nicely. It is nice to coexist. I love ferns! Have a happy day and week ahead! What beautiful, healthy 'greens'. Lovely. 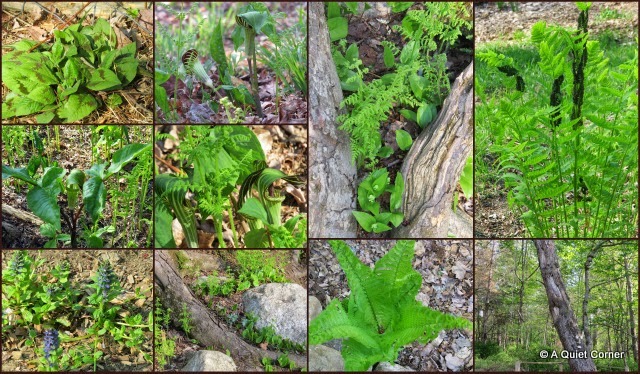 It's wonderful to see the woods come alive with greenery! I love the mosaics of the new life - so very pretty! Oh, what a lovely garden and woods. Very interesting and such awesome plants! 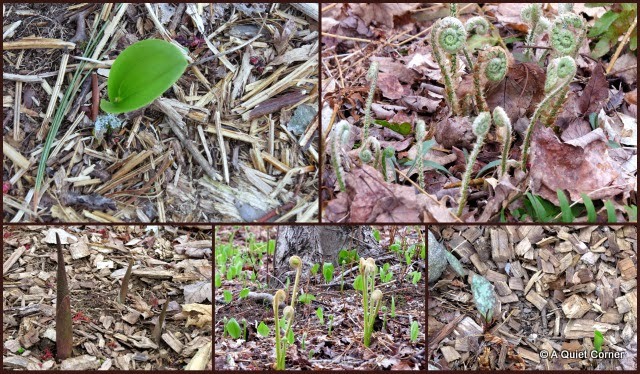 Is the first picture-top right also Jack-In-The-Pulpit? I've never seen it before. I have an area of my backyard that I call my Woodland Garden because of all the shade I have. I mostly have bleeding heart and lily of the valley and would love to add more shady-loving plants. A woodsy garden! I love the little ferns unwinding! So wonderful and natural. Such wonderful things you find in your woods! I can tell you love the woods and the woodland gardens I've created are my favourites. At least when you plant natives, you know they'll stand up to whatever Mother Nature throws at us. Oh what a delight to live n such a wondrous place and how green everything is. The coming of spring in your world is so lovely and so unlike our world in Western Australia. Thank you for sharing such splendour. I CAN tell you love them and I think it is wonderful the way you've integrated the woods with your home/yard. The first sentence of your post is beautiful. Stopping by from Nature Notes. I wanted to invite you to join us at http://image-in-ing.blogspot.com/2015/05/a-walk-on-beach.html - you have some lovely photos!